Hello, dear friends! It is just hard to believe that I have not written anything in my blog since April. We homeschool though the summer with short breaks and getaways from the city. One of the highlights of the spring was the second conference on homeschooling and raising children in Christian families. I was very encouraged first of all in my faith. As we are in charge of our own schedule we can have breakfast and read the Scriptures in the morning before studying. This is becoming a blessed tradition. Our 6 y.o. son Fedor has just learned to read and he is very enthusiastic about the Bible. He sits down and reads aloud a chapter from one of the gospels or more till he is stopped. We have read part of the Proverbs, the book of Daniel and now we are in Mark. We discuss and write down some thoughts. This picture was taken in May. Timothy (8), Yegor (13), Fedor (6) and Sophia (2). In July, right on my husband's birthday, Fedor suffered an eye trauma while playing with his brother. We spent the whole month at the hospital taking care of him. We are thankful for an outstanding surgeon, caring hospital stuff and lots of love and prayers from our friends. We believe that "...in all things God works for the good of those who love him, who have been called according to his purpose" (Romans 8:28). Fedor still needs more care and prayer for healing. After a long break I was finally blessed to have some creativity escape for my soul. It feels therapeutic. 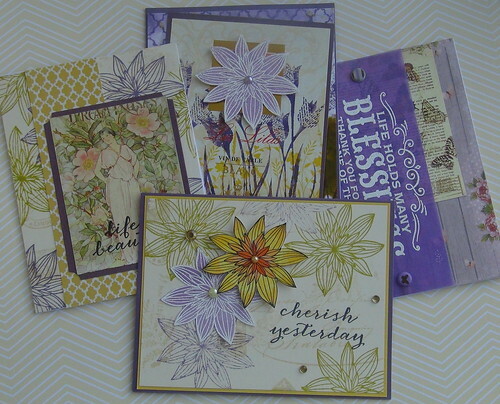 All these cards have been made from scraps and leftover pieces from old projects. For the cards I used a wine lable, patterned paper, distress inks, white embossing powder, Hero Arts stamps, pearls≥ms and card bases. Hi Maria, your kids' photo is so sweet! I imagine it is an extra challenge to raise kids as Christians in Russia. I will keep you in my thoughts and prayers in this endeavor. It is important to instill the values and spend the time with kids at this age. You are doing the right thing! 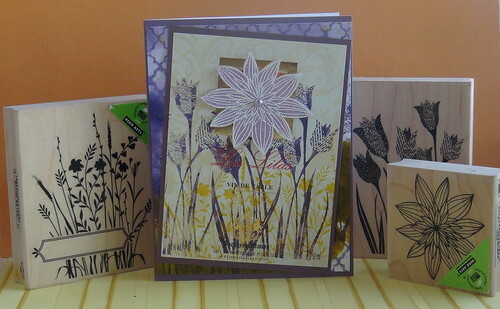 Happy to see your gorgeous creations with HA wooden stamps. They are great stamps to have! Thank you for the encouragement and comment for me in my blog. I miss St. Petersburg even though I was only there for a short time. Hugs to you! And I am sorry to hear about Fedor's eye injury. I pray that he will fully recover! Let's trust in Him! Maria, what an encouraging post to read. Sorry to hear about Fedor's eye injury but I am sure you shared the Lord's love with those around you while he was in hospital. I love your cards they are beautiful, born out of a beautiful spirit.